It was a tough Winter in New England and we have been looking forward to FirstGrill ever since we put together the Fuego Grill. 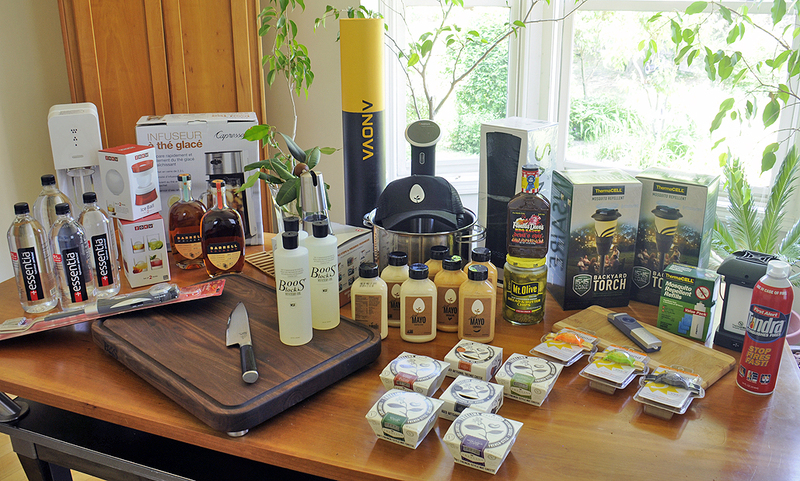 Every year we add new gear and tastes to enhance the FirstGrill experience. This year is no different. We are very excited to welcome the return of some previous sponsors and the introduction of new ones. Today, we are going to focus on the new gear sponsors and save the edible items for tomorrow and Friday. Shun Classic 8″ Chef’s Knife – An all-purpose blade ideal for a wide variety of cutting tasks. The eight-inch length is perfect for slicing, dicing, and chopping small to medium-sized fruits, vegetables, and other foods. The wide blade keeps knuckles off the cutting board and is extra handy when transferring cut food from board to pan. With its curved belly, the Chef’s knife can be gently “rocked” through fresh herbs or spices to produce a very fine mince. Shun Classic’s thinner blades makes it lighter and less tiring to use than comparable European-style Chef’s knives. We swear by Shun knives. 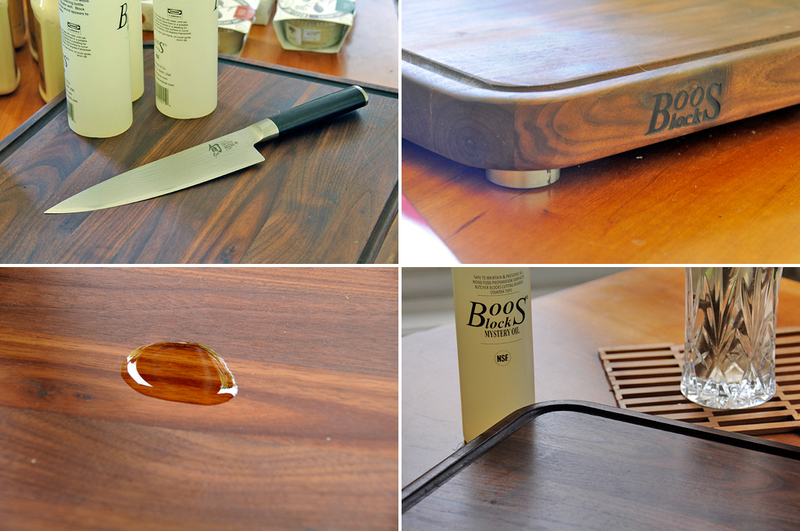 Boos Walnut Tenmoku Cutting Board – Made in the U.S.A., the Tenmoku has a 1-1/2″ thick edge-grain construction and stainless steel feet. Named after an ancient tenmoku glaze used in Asian pottery, the rich colors are similar to that of tenmoku pottery. The juice groove within the cutting board resembles the tenmoku tea bowls, holding the liquids until poured. Boos Block Mystery Oil – A secret blend of white mineral oil, carnauba wax and beeswax, useful for replenishing moisture lost through repeated washings and simple evaporation. We wiped a layer on the new Tenmoku board (before, after) to ready it for FirstGrill. The oil is also useful for wooden bowls, salad spoons, etc. We have been experimenting with Sous Vide cooking in the RainyDayKitchen. The two immersion cookers we have been using are the Anova and the Sansaire. As the technique of Sous Vide cooking is new to many home cooks, we thought we would let FirstGrillers get an up-close look at both devices. 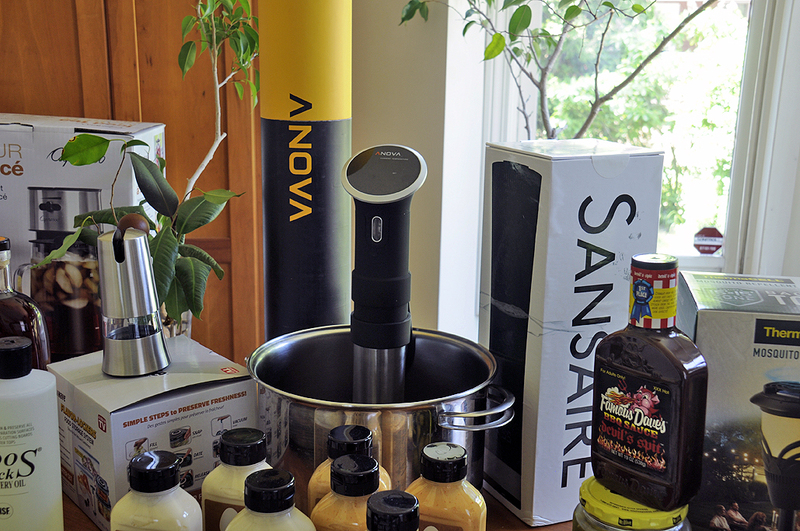 Anova Sous Vide Cooker – Go here for more details on cooking steak with the Anova. 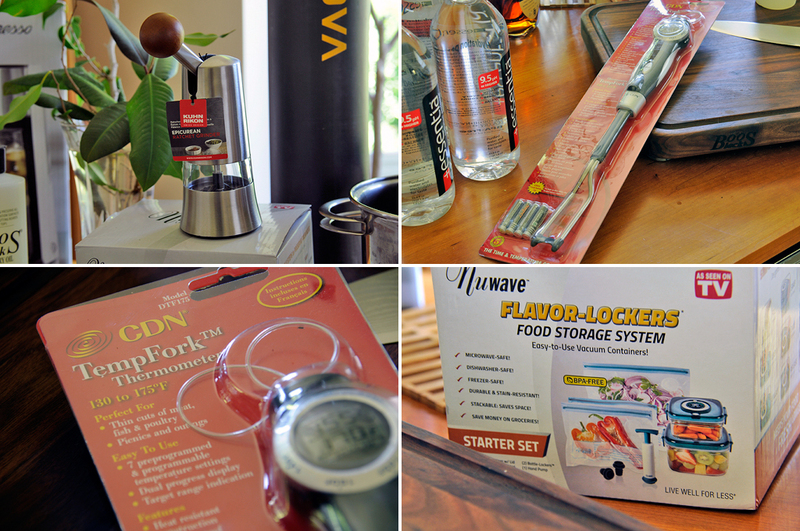 Sansaire Water Immersion Cooker – Go here for more details on cooking steak with the Sansaire. While this FirstGrill will not have a head to head comparison of the two Sous Vide cookers (that’s coming later this Summer), we do plan on comparing straight grilling vs Sous Vide cooked/grill-finished meats. We will be noting our guests’ reactions to the differences in taste and feel between the two methods. Kuhn Rikon Ratchet Grinder – Ceramic grinding stone, adjustable grind, ergonomic handle. CDN TempFork – Preprogrammed & programmable temperature settings. Measurement Range: 130 to 175ºF. Tines made from 304 stainless steel. Nuwave Flavor-Lockers Food Storage – Flavor-Lockers containers are perfect for storing everything from fresh produce to bulk meats and even leftovers. However, our interest is in the reusable and re-sealable Flavor-Lockers bags. We wanted to see if the vacuum technology will enable us to marinate meats quicker. 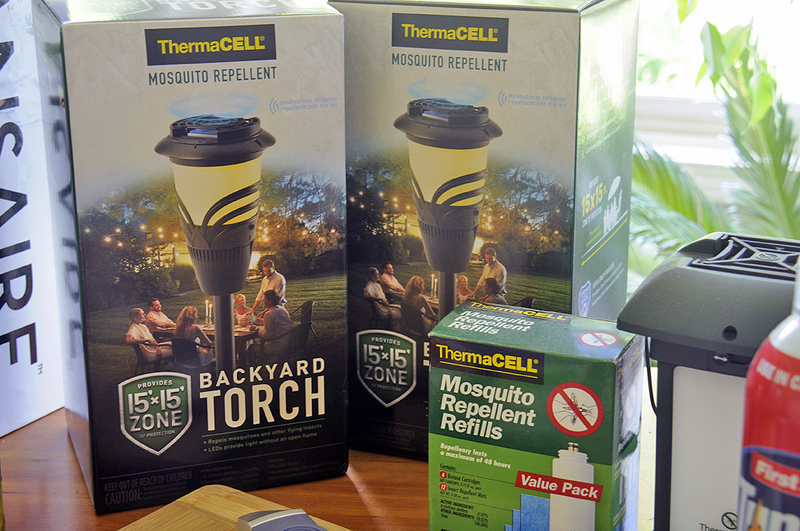 ThermaCELL – Torch and Lantern : No candle or open flame, 15 x 15-foot area of mosquito protection. Therapik – Getting bitten by mosquitos is inevitable, but having to put up with the itchy bite is not. Therapik offers drug-free relief in as quick as 30 seconds. How does it work? Most insect venom is thermolabile (sensitive to heat). Therapik®’s patented technology delivers heat in the specific temperature range necessary to neutralize the venom of most biting insects. We used to use a hair dryer, but running an extension cord is kind of a pain. The pocket-size Therapik is portable, convenient, and it really works!!! 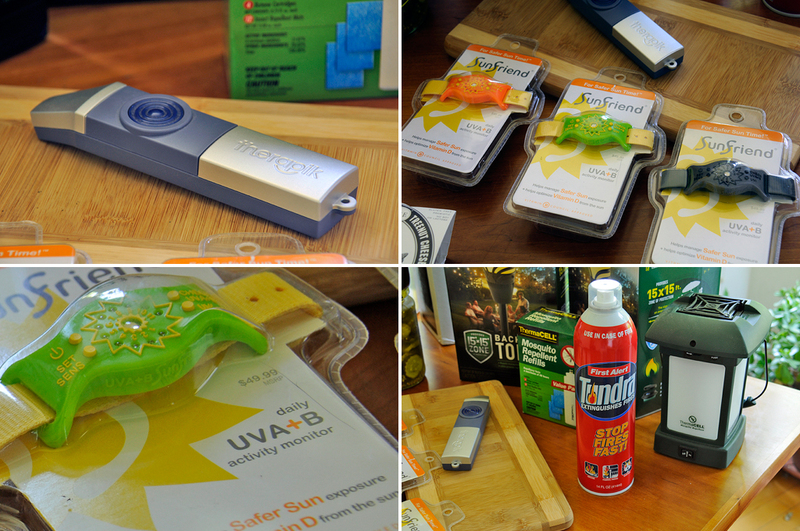 SunFriend UV Detector – There are a lot of health benefits from getting some sun exposure, as long as you don’t get too much. With help from UVA+B SunFriend® it is possible to safely enjoy the health benefits of the sun and increase vitamin D levels without the worry of overexposure. The SunFriend sensor takes a reading from the environment every few seconds, and also reads reflective UV. When all eleven LEDs light up and are flashing, then it is time to cover up and/or get out of the sun. First Alert Tundra – Most grill fires have a grease component which can be tough to put out. This is why we ALWAYS have a can of First Alert Tundra fire extinguishing spray within easy reach. Tundra has 4x longer discharge time vs. traditional fire extinguishers. It is simple to use, cleans up with just a wipe, and it’s biodegradable. Tomorrow we are going to take a closer look at the sponsors providing the edible items. On Wednesday we’ll have the FirstLook of the Fuego Grill. On Friday, we’ll have a look at the meat items from Morgan Ranch in Nebraska and Tony’s Market in Roslindale. First Grill. First Furmint. First Vermont. First Emptied. "Nobody leaves until all the food is gone!!!" Great article! Lots of summer sunshine coming! Make sure you have your SunFriend on!